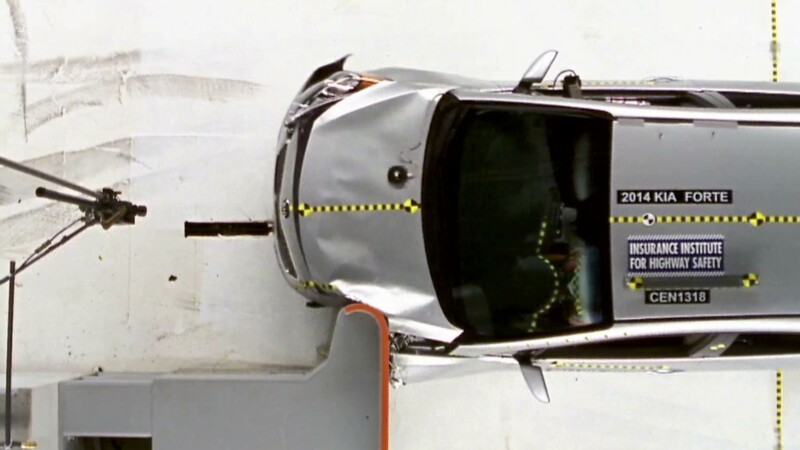 The Honda Civic earned top scores in the Insurance Institute for Highway Safety's new "small overlap" crash test, but similarly sized cars from Kia and Nissan fared poorly. The Institute put 12 new compact cars through the test, including two- and four-door versions of the Civic and two Kia models. The Kia Soul and Forte, as well as the Nissan Sentra, earned the worst possible rating of "Poor" in the test. Kia and Nissan both pointed out that their cars have performed very well in other Insurance Institute and government crash tests. Kia also noted that the "small overlap" crash test "goes well beyond federal requirements." Both automakers said they would review the test results as they seek to make further safety improvements in their cars. This was the first time compact cars were subjected to this new type of front crash test. In it, the cars are propelled at 40 miles an hour and strike a crash barrier with just one quarter of the front bumper on the driver's side. That concentrates impact forces into a small area that often falls outside crash protection structures built into the cars. The impact also spins the car violently. The test mimics a type of impact that accounts for nearly a quarter of all front crashes with serious or fatal injury to front seat occupants. "In the worst cases safety cages collapsed, driver airbags moved sideways with unstable steering columns and the dummy's head hit the instrument panel," David Zuby, the Institute's chief research officer, said of the test results in a written statement. Also, side curtain airbags sometimes didn't deploy or they didn't provide coverage far enough forward in the car to be of any help, he said. In the case of the two Kia models, the cars' seatbelts spooled out too much, allowing the crash test dummy to move too far forward. At the same time, the side curtain airbags didn't provide protection that far forward in the car, allowing the dummy's head to hit the windshield pillar and instrument panel. The Kias' steel structure also provided insufficient crash protection in the tests, according to the Institute. When the IIHS put a group of luxury cars through the same test in August, the first time results for the new test were released, only two cars out of 11 got top marks. The Institute has also put mid-sized cars and small SUVs through the new test. In this case, while only the Civics earned the top possible rating of "Good" in the side impact test, the Dodge Dart, Ford Focus, Hyundai Elantra and Scion tC were rated "Acceptable." That was good enough to earn them, along with the Civic, the Institute's "Top Safety Pick Plus" award. That award is reserved for cars that perform well in all of the Institute's crash safety tests. The Chevrolet Sonic, Cruze and Volkswagen Beetle earned "Marginal" ratings in the test. The Toyota Corolla wasn't tested because Toyota (TM) will be releasing a completely redesigned Corolla later this month.